Windows 10 PC supports Xbox Game Controller. You can connect it to your PC and play games that support it. You can also play Xbox games on your PC and use the controller to play games when your Xbox One console and PC are far away. 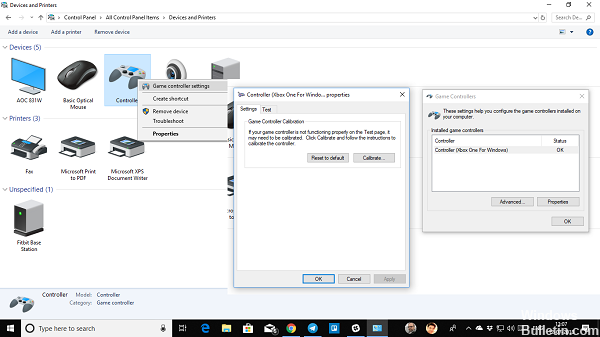 However, the controller often doesn’t seem to work properly, and if it does, you may need to calibrate the Xbox One controller on Windows 10. That’s exactly what we’ll talk about in this guide. You will know if your Xbox One controller needs to be calibrated if you have gaming problems on your PC. Sometimes the trigger is not released in time or something is wrong with the controller axis. They all lead to random movements during play. You have two options. Either you can reset the controller to the default settings, or you can try calibrating it. We suggest you do this later. Connect the Xbox Controller to your PC via the USB cable. Open Control Panel > Control PanelAll devices and printers in the Control Panel. First, you can test all the keys and triggers of the controller and see if they react again. This starts an assistant that calibrates your control axes. During the operation, you will be asked to press different keys, sometimes leave the axes unchanged and so on. You will see a lot of rotation instructions for the X axis, Z axis, Dpad and you will need some time to complete them. When you are finished, you can now try the first tab we skipped above to see if your controller is properly calibrated. If this still does not work, you can reset the controller. We had this option under Gamepad Settings. This should solve the calibration problem of your Xbox One on Windows 10 PC. If you still have problems, you can connect to an Xbox and try changing these settings on Xbox One. Xbox One allows you to assign different buttons and swap them if you are used to these types of settings.